It's a great thing, when you can arrive at a resort, and never have to leave the property. What do I mean by this, well here goes - 2 championship courses, Arnold Palmer Golf Academy World Headquarters, Spa, Fitness center, two fantastic restaurants, sports bar, lounge, poolside cafe and superpool bar. The greatest thing about all this, is that it's all within walking distance of your accommodations. Speaking of accommodations - Deluxe guest room, One bedroom suite, Two bedroom suite and Three bedroom suites are available. All rooms have new Tropical Bahama furniture - very nice look. One well know sports writer refers to this unique property as "One of Florida's quintessential golf resorts". I spent the weekend here recently and can tell you first hand how much I enjoyed it. I could play 18 holes of golf, have a great dinner and end the night either listening to the poolside band or with a quality cigar on my balcony overlooking the resort. Let me talk about the 2 courses for a moment. 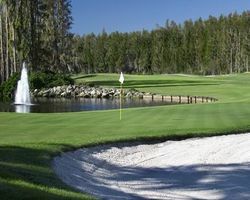 The Saddlebrook Course - This course has your typical Florida look - natural beauty! The par 70 course winds its way through towering cypress, draped with Spanish moss and beautiful blue water. It is currently going through a 2 million dollar renovation - completed in Mid-November. The Palmer Course - This course has generous driving areas with firm green contoured fairways to resemble a rolling New England course - level ground is rare. The beautiful look of each hole along with the different variety that each hole brings, makes this par 71 a great test. These are both stay and play courses. In a nutshell - if you have a group of golfers that want to check into a resort, have two quality golf courses to play, eat at great restaurants, drink cocktails by the pool and do all this with never having to get in your car until the day you depart - THEN SADDLEBROOK RESORT IS FOR YOU! For more information about Saddlebrook resort or to book you next golf outing, call 888.333.6103 or go to http://www.golfzoo.com/-dest-FLTA-vendor-SADSAD-_param-1-.htm?utm_source=Blog&utm_medium=Blog?utm_content=Saddlebrook.